Is Microsoft Bing Crawling Google AdWords Ads? A WebmasterWorld thread has some Google AdWords advertisers concerned that Microsoft's search engine crawler, BingBot, may be crawling their Google AdWords ads. Was just checking some ranking in bing and noticed a result listing a url on my site that was set up for an adwords ad, now how in the world did they end up with that in their results? Of course, there are several ways Bing could have discovered the URL above. (3) Someone on the web linked to the URL and Bing picked it up. (4) Server logs could have been open for Bing to crawl. 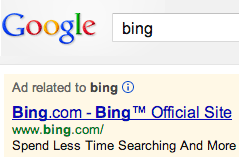 (6) and on and on... Are you concerned Bing is crawling your Google ads and costing you money?